Due to the generosity of great friends, Bill and Elaine Cave of Asheville, my family has enjoyed a summer respite on Isle of Palms in South Carolina for a decade or so. We made it down around 5 p.m. on Sunday (8/2) – still enough time for the girls to hit the beach for a while. The next morning Denise and I took our coffee to the end of the pier that reaches out into the brackish marsh. It’s nice watching the marsh wake up in the early morning. We were greeted by marshy sounds – the popping of pistol shrimp; the laughing of gulls; the grunting of great egrets; the cop-cop of green herons; the loud tic-tic-tic of a clapper rail; the chirping of barn swallows hawking insects and the splashing of minnows and fish in the shallows as the tide flowed in. Some splashing and movement under an adjacent pier caught my eye. I could see a small “bump” just breaking the surface of the water. I took another sip of coffee to try and jump-start some grey matter, to determine what I was looking at. Crab seemed most logical but I couldn’t figure how a crab could present that kind of image; maybe a frog? ; and then the bump submerged. We continued watching and listening as the sun climbed. Pelicans and a wood stork joined the aerial display. A great crested flycatcher added its empathic “weeep” to the morning chorus. And I kept a watch on the water near the adjacent pier. I heard some splashing and then the bump reappeared. Only, this time there were two bumps – and the unmistakable profile of Alligator mississippiensis, the American alligator. When an alligator is at rest in the water, often only the head breaks the surface. 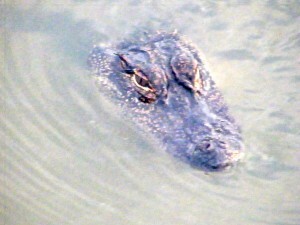 The eyes create a silhouette or bump, plus, in front of the eyes (depending on which way the gator is facing) is a smaller bump – the nostrils. The rest of the snout is usually underwater, thus not visible. While it’s not an exact science, and on exceptionally large gators (10 feet or better) it may be even more skewed – you can mentally measure the distance between the eyes and nostrils in inches – say it’s five inches – and that gives you a really good approximation of the length of the gator in feet – five feet. Now, this was a little fella 3-4 feet, but was still a bit of a surprise. Alligators seem to have an aversion for brackish – and even more so for salt marshes. I don’t know the “whys” for this – if it’s physiological or simply a preference. I tried a short Internet search this morning but couldn’t find anything definitive – only, that they have a preference for fresh water. A hundred years or so ago, when I was in college, I did an internship at Rockefeller National Wildlife Refuge in Cameron Parish, Louisiana. We caught alligators all summer. I remember we got a call one day reporting a large (10-feet plus) gator beached in the Gulf of Mexico. A crew went out and rescued him and I remember hearing that once they get in salt water it impairs their “homing” ability and they become disoriented. This guy just followed the tide as it was coming in. He passed next to our pier and seemed to be following the water as it rose. It’s not uncommon to see gators in the fresh water lagoons on Isle of Palms and hopefully “our” gator was just simply headed home after a night of foraging.